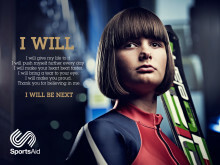 SportsAid athlete Millie Knight (see photo) has been given the honour of carrying the flag for Great Britain at today's opening ceremony of the Sochi Paralympics. Millie's new guide is Rachael Ferrier alongside whom she will be competing in the B2 slalom event in Sochi. Age 15, Millie is the youngest member of the British team and the youngest winter Paralympian in the history of British sport. "Millie is a very talented athlete and an exciting prospect for the future," said ParalympicsGB chef de mission Penny Briscoe. "She is the perfect representative for the team on this occasion." Call Breege Zachary or Simon Worsfold at SportsAid on 020 7273 1978 or email breege@sportsaid.org.uk or simon@sportsaid.org.uk. competing – which they otherwise have to pay for themselves.